Glenn Maclean left the DoC fishery team in the last 6 weeks. The Advocates have appreciated Glenn’s willingness to talk with us on matters concerning the fishery. He had built up a large knowledge of the fishery. Such institutional knowledge is hard to replace. Thank you Glenn. The river is clearing itself of the silt and sand observed over much of its length in recent weeks. The bed of the river looks good and there are fish in the river. 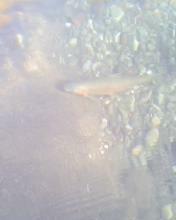 I took this photo of a trout resting a meter away from my feet with my cellphone. The sand was reduced in depth and gravels emerging. The trout seemed unconcerned by my presence. Usually they sit in the current caused by my feet. Meeting Friday 1 July 2011 with Neil Jelley, Genesis Hydrologist, Michel Dedual, DoC scientist, Stuart Crosbie, Ross Baker, Eric Wilson. Neil came to hear the question as to excess silt and sand in the river. He advised that the gates of Rangipo Dam were opened on the 12th May and since June last year there had been one other event. There is insufficient capacity behind the dam for significant quantities of sand and silt to be spread through the river as we were claiming. We eliminated a land slip into the river and erosion from the felled pines as causes. We had a discussion as to the consent conditions for opening the gates and Neil assured us that they had complied in the 12th May event. Michel said that this was DoC fisheries greatest concern when the consents were advised and that Genesis used Graham Smart and Ian Jowart to argue their case with their scientific studies. The consents were granted and seemed to have worked well until this event. Neil will consider our evidence and see what can be done. He has offered the committee a field trip to Rangipo Dam to show us the area and what happens. The sand has cleared most of the Plank Pool and the Reed Pool as of 4 July. There is still a lot of sand in quiet areas which in its current liquid state is very dangerous. One angler in Wadells Pool tested the sand and found it firm but his next step saw him in trouble as he put one foot into quicksand necessitating him to crawl out on hands and knees. This was my experience when I first noticed the sand in the Reed Pool but there the sand though liquid was only a foot to eighteen inches deep. I have been impressed by the co-operation and concern from all I dealt with at Genesis Energy. A word of advice when you wade. Treat areas of sand with great caution. There are pockets where the sand is liquid and you can sink into it with speed. Getting out has been difficult for more than one angler. Pools where this has been a concern are Waddells, Bain, Jones. There has been a significant amount of work done clearing willows from the full length of the Hirangi Arm which is a branch of the Tongariro River from the Swirl Pool to the Reed Pool. The area cleared and still being worked on is at a guess100 to 200 meters wide and 1 kilometer in length. This photo is from the head of the Reed looking South up the Hirangi Arm. The felled willows have been stacked ready for burning. I emailed the following message to Lawrie Donald, Zone Manager Lake Taupo and Upper Waikato Zones. I have noted the progress of work on the Hirangi Arm. It looks impressive. Can you tell me exactly what the work is to achieve. The removal of willow from the Hirangi arm is to remove the vegetation impediment from the floodway to allow flood water to flow and not back up in times of high flow. If flood flows back up in this region of the river there is a possibility of over topping of the stop bank upstream of this area. In the next year and into the future there will be an active vegetation management of the floodway over the full reach of the stop banked reach. In the resource consent application there is a note of the control of vegetation that exceeds 1.5m. This does not mean that we will remove all vegetation but will be assessing the impact and removing that vegetation that will cause a problem in the floodway. Take for example the build up of the island below the bridge and down to the Swirl Pool. The vegetation of broom, buddleia and other vegetation is becoming thick and will in time develop into a solid barrier to flood flows. This vegetation takes up space for water flows and as such impacts on the volume that can fit down through the floodway. In this area we propose to manage the vegetation to be mostly toitoi and not allow too strong a vegetation mix to get too big. Departing President of Federated Farmers Dairy section head, describes Trout as freshwater stoats. “Before he left he gave one last gem of a speech which combined reasoning with emotion. He told the annual conference he wanted to examine three common statements to establish if they were fact or someone’s opinion. These were that “trout have no effect on our waterways”, “we need to control nitrogen loss from farms in order to stop increased nuisance algae” and “but river water quality is declining”. On the trout issue, he pulled no punches, describing them as freshwater stoats. He cited research that showed trout out-compete native fish for food, forcing them into less- preferred waterways. The trout eat invertebrates that feed on algae, and the research showed that in trout streams there was six times more algae than in streams populated by native fish. This also meant trout streams were more sensitive to nitrogen and phosphates, he said. 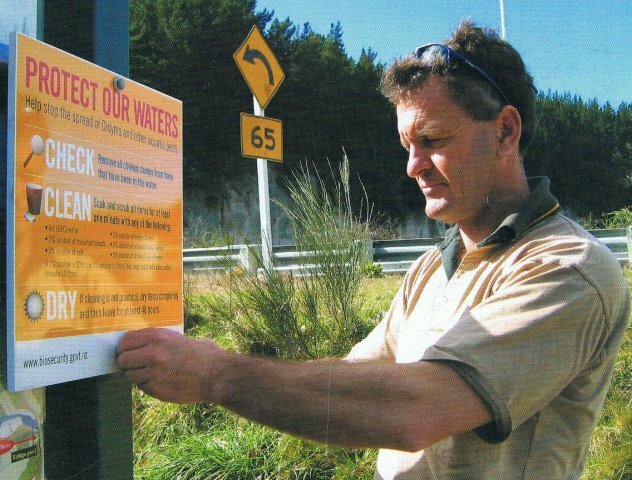 “We have jaundiced freshwater ecologists blaming land-based industries when they should be looking at what is eating the basis of the food chain, unbalancing our native aquatic biodiversity. You be the judge. I have my opinion as to who won this argument. A new licence. A new season from July 1st. My reports are my experience from fishing and observation. 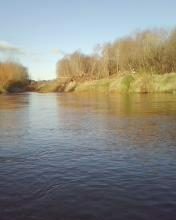 There are few anglers on the river. This is a joy from a selfish perspective. The enjoyment of a pool to yourself which in the peak season, which should be now, is a rarity. There are fish to be caught. For me, not a lot, 1 a day. Some of the fish are small, around 1kg but I have caught a couple of nice sized trout in excess of 1.5kg. The fish are nicely proportioned and when opened the flesh is orange to red. I am enjoying my fishing at the moment.